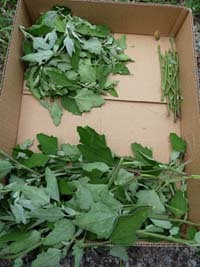 Edible Wild Food Blog » Lamb’s Quarters: Roast Those Soft Stems! Two summers ago I started exploring using as many parts of a fresh vegetable as possible in order to maximize their use on the dinner table. Depending on where you have grown up and your cultural background, there are many of us that grew up missing out on many great food opportunities. Although I will be discussing lamb’s quarters, here are a couple of vegetable examples. I grew up with the understanding that the beet root was the part of the plant used and all other parts were discarded. Yikes did I miss out on a lot of goodness! Beet leaves (according to Self Nutrition Data) are a good source of protein and a great source of dietary fibre. They contain vitamin A, B2, B3, B6, B9, C, E, K as well as calcium, copper, iron, magnesium, manganese, phosphorus, potassium and zinc. It also contains pantothenic acid – also known as vitamin B5. Not only are the leaves to be used but the stems as well. Cut them up and toss them in a salad or roast them! There are a couple of examples of how there is a plethora of food to be had in items that many do not think about. However, cultivated vegetables are not what I am here to promote. This summer I decided to take the same attitude with my foraged greens as I have with my farm fresh vegetables. Lamb’s quarters (Chenopodium album), are loaded with goodness. Rich in vitamins A, B1, B2, B3, B6, and vitamin C this incredible plant is loaded with minerals including calcium, magnesium and selenium. It doesn’t stop there because lamb’s quarters are a great source of fibre and protein and contains Omega -3 and Omega-6 fatty acids. I have enjoyed fresh lamb’s quarters from my garden all summer. However, on a recent mini-vacation in Niagara Falls, as my spouse was fishing, I took advantage of some lamb’s quarters I discovered. As I was removing the leaves I kept the soft “mini-branches” that grew off the main stem. There are just as tasty to eat as the leaves so why waste the goodness? I brought them home and decided to roast them. Not one was left after the family meal. If you collect lamb’s quarters and you’re going through the work of taking the leaves, be sure to keep those soft branches as well! (Use only the soft ones though because the hard stems are way too tough.) They’ll keep in the fridge for 2-4 days and they make a great healthy addition to a meal! Roasted lamb’s quarters are easy to bake and take very little time. Next on the list to experiment with now are the long stems of purslane! Stay tuned! Wow funky food! Free too – thanks for sharing!!!!!!!!!!!!!!!!!!!!!!!!!!!!!!!!!!!!! Never though of roasting the stems to lambs quarters. Going to have to try that one soon, they’re still in season near here. The beauty of cooking with wild edibles is that if you make a mistake it is ok…. it was free food!! I roast beet stems and thought why not anything with a stem that has nutrition in it!! Yep thats true and theres normally an abundance of it too!